Cathaoirleach of Kerry County Council Cllr Norma Foley with Chief Executive of KCC Moira Murrell and Head of Finance at KCC Angela McAllen at the planting of the tree on Monday. 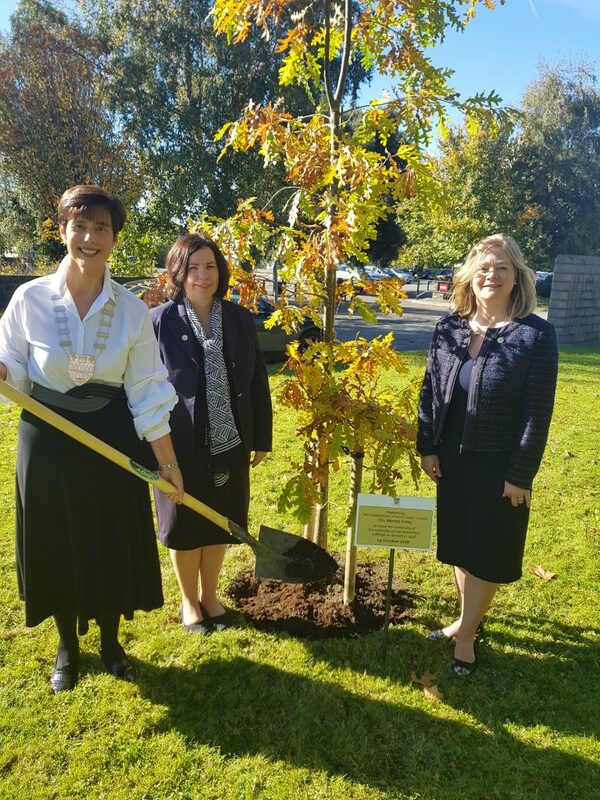 A TREE has been planted in the grounds of County Buildings in Tralee by the Cathaoirleach of Kerry County Council to mark the centenary of the extension of parliamentary suffrage to women in 1918. Cllr Norma Foley planted the oak tree at Áras an Chontae this afternoon to mark the 100th anniversary of the first general election in which many Irish women were entitled to vote for the first time. In February 1918, the Representation of the People Act extended the vote to all men aged at least 21 and women aged 30 or older who were university graduates or owned property. The general election of 14 December 1918 was the first occasion on which women in Ireland were entitled to vote in a parliamentary poll. “As Cathaoirleach of Kerry County Council, I was pleased to mark this important centenary by the symbolic planting of a tree in the grounds of Áras an Chontae,” said Cllr Foley. “The enfranchisement of women in 1918 was an important first step to achieving full suffrage for women in Ireland and is one of the many important centenaries that occur at this time. “I hope that this tree will serve as a symbolic memorial of the centenary of the first extension of the parliamentary vote to women in this country,” said Cllr Foley.